Israel KeyesThe Alaska State Troopers have provided this update on the autopsy of Israel Keyes. An autopsy is being performed on the body of confessed killer Israel Keyes, who died in an apparent suicide in his cell at the Anchorage Correctional Complex Sunday. Keyes, who admitted murdering Anchorage Barista Samantha Koenig and a Vermont couple, was being prosecuted by the U.S. Attorney’s office. Authorities were still investigating his connection to other missing people in other states. About 6:30 Sunday morning the Alaska State Troopers Alaska Bureau of Investigation got a call about Keyes’ death. Keyes was being held at the Anchorage Correctional Complex while prosecutors with the U.S. Attorney’s office built their case against him for the murder of Anchorage Barista Samantha Koenig. Troopers have not yet released details regarding the suicide. Ipsen says results from the autopsy are expected soon. Kevin Feldis is with the U.S. Attorney’s Office in Anchorage. He is part of the team that has been interrogating Keyes. He says, in discussion with investigators, Keyes confessed to the kidnapping and murder of Koenig. 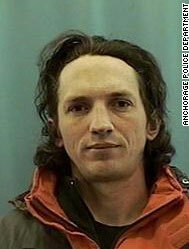 Keyes abducted Koenig from the Common Grounds Coffee Stand in Anchorage on Feb. 1. Feldis says Keyes also admitted to killing Bill and Lorraine Courier, a couple from Essex Vermont. And Feldis says, Keyes admitted to killing at least five others. “The names of those victims he would not identify nor would he identify where they were originally from. So we don’t know if they were from Washington or perhaps one of the surrounding states. He also admitted to us having disposed of a body, of someone he had killed, of disposing the body in New York. Again, he would not reveal the name of that victim or where they were from. He also admitted there were other victims. But as of this week, those discussions were ongoing regarding who they were and trying to convince Keyes to provide additional details,” Feldis said. Feldis says, conversations with Keyes supplied investigators with many helpful details that they will use to continue their investigation into his other crimes. With Keyes gone though, Feldis says, investigators will be relying on the information they have. He says authorities were getting new information from Keyes as late as last week. “And there may be things that we may never be able to uncover that only Mr. Keyes knows about,” Feldis said. The Anchorage Police Department partnered with the U.S. Attorney’s Office on the Investigation of Keyes. Chief Mark Mew says Keyes’ death frees up authorities to release information they had been withholding from the public. And they hope that may provide help with other unsolved cases. Mew says, the FBI has compiled the records of Keyes’ movements based on travel documents, purchases and financial transactions to try to track every place he’s been in the past decade. They hope the travel timeline will provide clues to the crimes that Keyes implied he’d committed. But Mew echoes Feldis, saying Keyes death is a blow to investigations. The question looms – how was a high profile prisoner like Keyes able to kill himself while in custody? Director of the Alaska Department of Corrections, Bryan Brandenburg says there are procedures in place that were supposed to keep Keyes from killing himself. “In Mr. Keyes’ case, he was in segregation. Typically most high profile cases, those folks are kept segregated from the general population. And everyone when they enter the jail within the first 24 hours they get a mental screening. And then if there’s any signs that they may hurt themselves, they’re referred to our mental health staff,” Brandenburg said. Brandenberg says Keyes did not show signs that he might commit suicide.